For those listeners who are still deep in the ice and snow of a northern winter, here’s a taste of the coming Spring. This recording was made yesterday on the banks of Tottiford Reservoir in Dartmoor National Park. The maritime climate here means that although cold weather is still possible at this time of year, the average daytime temperate is well above freezing (when I made this recording it was 7C), the first flowers are already appearing and the buds are breaking on the trees. When I left home at 05:30 a full moon was high in the sky and the birds in the coastal town where we live were already in full voice. During the drive to the reservoir a thick band of cloud covered the sky, and when I got there I was greeted by total silence except for the dripping of trees still wet from the previous night’s downpour. It was another half-hour or so before the clouds broke, allowing the dawn light to filter through and the birds to start singing. 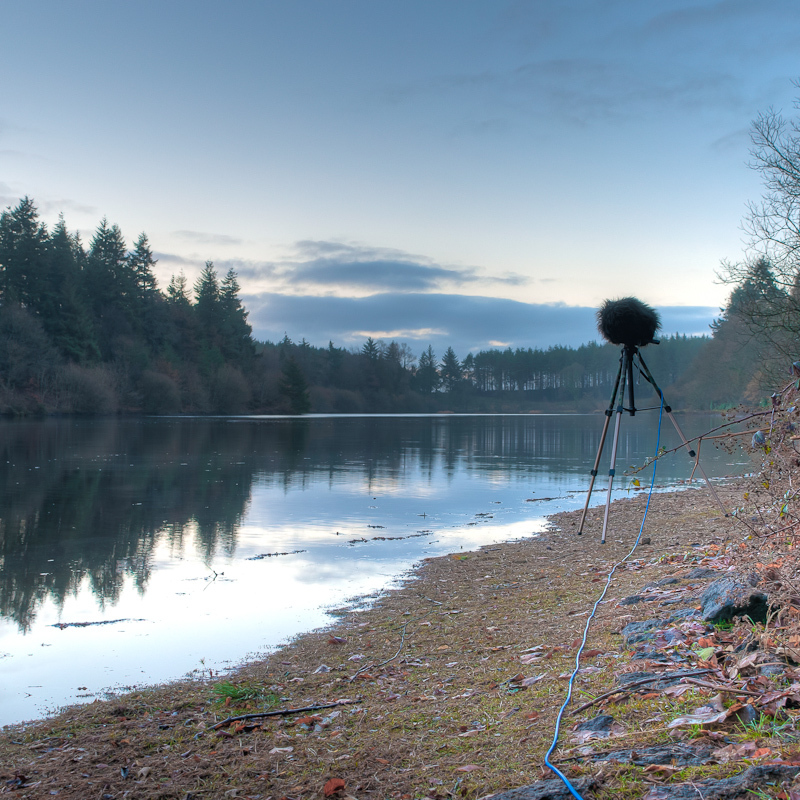 The microphones (2 x AT4022 in a partially baffled boundary array) were located right on the shoreline at a narrow point in the reservoir, facing across the water towards a hillside covered with conifers and birch trees. Listen out for the twittering calls of a flock of Crossbills as they fly across the lake, and the occasional distant wing-claps of displaying Woodpigeons. 6 Responses to "Signs of Spring"
Nice recording Tom, have been playing it a lot. You have some interesting recording kit. I have just got hold of an Olympus LS-11 and am intent on getting some HD video to go along with the built in Mic recordings – will see about some better mics once I see how they perform (WL183s perhaps to start with). I am over in Plymouth so could well get out to Haldon, have walked there in the past. I’m trying to hike around with a DSLR on a tripod with the audio recorder this year, will post it up somewheren (Vimeo?) If it works out. Love your site, keep up the good work, its getting noisy out there now! Glad you enjoyed the recording. I’d love to get into combining video and sound – my current DSLR is stills only, which is quite frustrating, especially since my wife has a newer one which does superb HD video. Let me know when you get some stuff up on Vimeo, I’d really like to see what you’ve produced! Hi Tom, finally got round to posting http://vimeo.com/22118940 Not figured out how to get the video up without compression artifacts yet but the sound is pretty good. Lots of problems of course – grass makes an amazing amount of noise under your boots if you move and the ever present noises of farming are difficult to escape. I’ll flag anywhere I find that is quieter from this perspective. Lovely video, looks like a beautiful evening. Re. the compression artefacts I think you’ll need to raise the video bitrate quite a lot to eliminate these – have a look at http://vimeo.com/help/compression if you haven’t already seen it. Watching your film inspired me to take my wife’s camera along on my latest recording trip and capture some video of my own – see my latest post! Hi Tom… beautiful recording! Are you still using the setup described in your May 31, 2010 posting? It would be very interesting to see/hear details about your current setup (partially baffled boundary array). Thanks in advance. I look forward to checking out more of your sounds.